Last April I did a blog post about some foil numbers that I picked up at Paperchase in London many years ago. You can read it here. Each letter had a British inspiration to go with it. 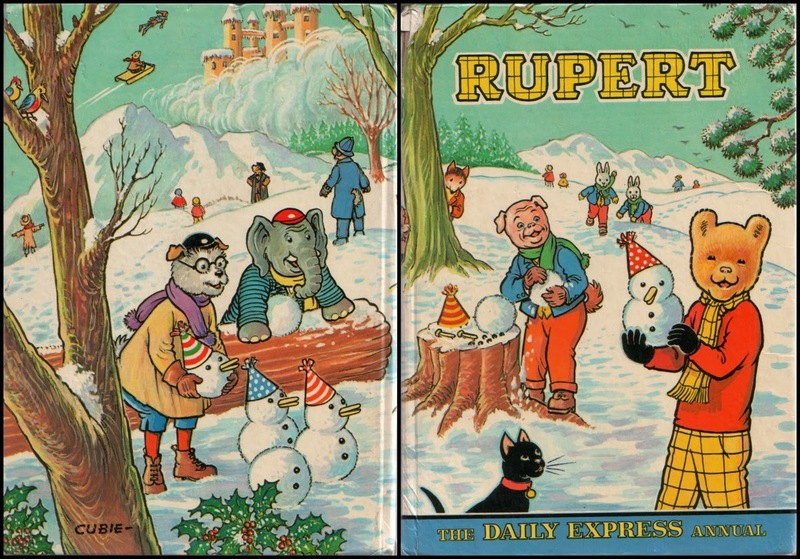 Number seven was the Rupert Annuals. Here are some of the annuals that I have collected over the years. 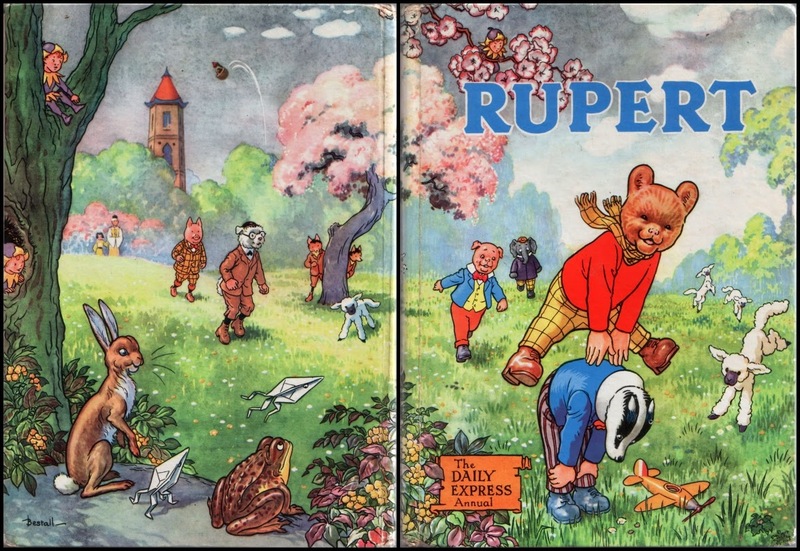 I didn't realize that a lot of my posts over the last couple of years have so much in common with the spirit of the Rupert Annuals, they really have been an inspiration to my work. Throughout this post I will have links to previous posts that tie in with each of the images that I have chosen. Every year at Christmas beginning in 1936 a new annual is published. The front and back of this annual is from the 1960 edtion. I love fireworks and I love an artists depiction of the exploding fireworks as well as his/her interpretation of the fireworks casings. Guy Fawkes Day is on the fifth of November and has made an appearance in one of the annuals. The very first "a little tour of my brain" blog post was about fireworks. This illustration is from the 1958 annual. The covers of the annuals have characters and situations from the stories appearing in a vignette. 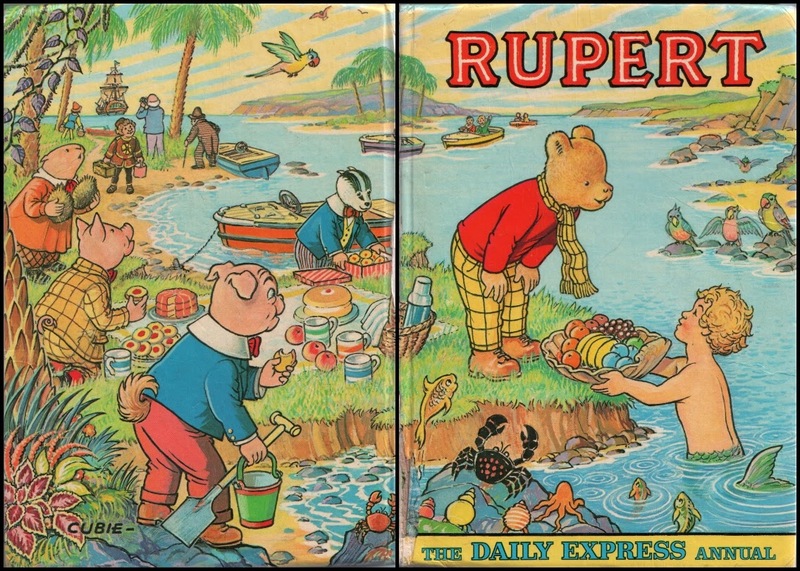 This is the cover of the 1958 Rupert Annual. 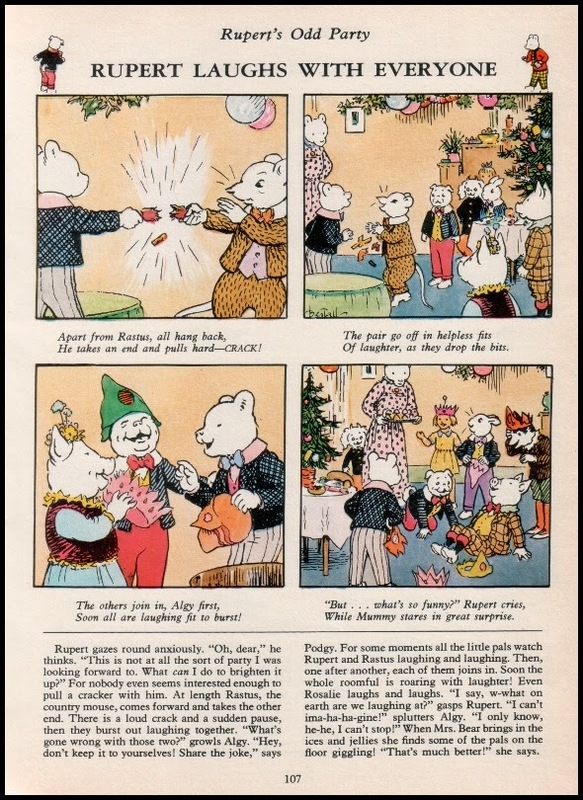 The 1984 annual has this page of the residents of Nutwood where Rupert and his family live. We are in the 21st century but Rupert resides in the 1930's. This literary and artistic device gives way to some great mechanical inventions, almost "Kiddy Steam Punk". 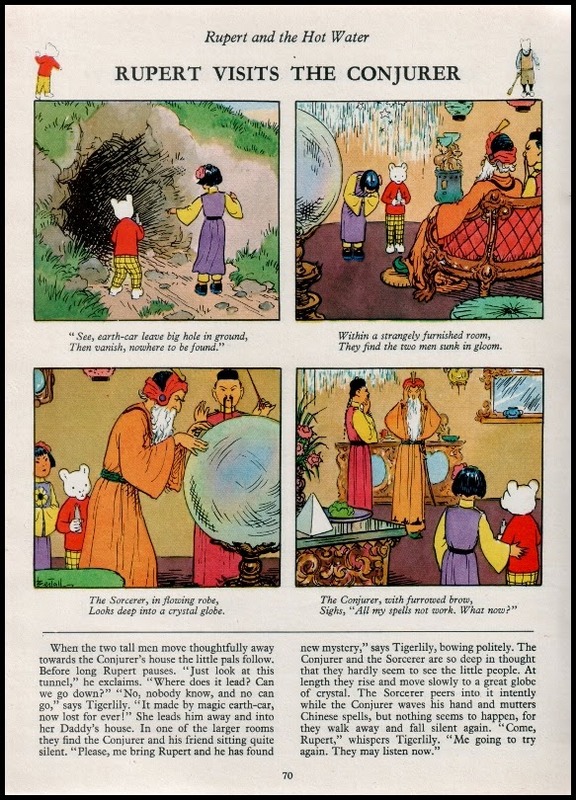 Besides these characters Rupert visits Father Christmas, the imps of Spring and Autumn, Jack Frost, mermaids and mermen and other creatures under the sea, as well a host of other characters from around the world on a regular basis. The way that I think about the characters that I create has been greatly influenced by the annuals. They are from an ongoing cast and their interaction is very important to the pieces I create. I know and understand who they are and what they will do and say. 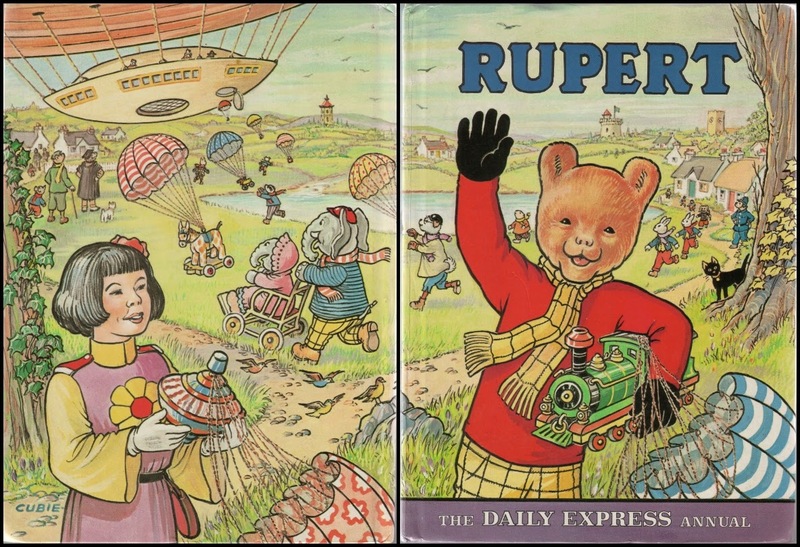 This 1976 Rupert annual shows an airship with a flying saucer styled structure hanging underneath it. 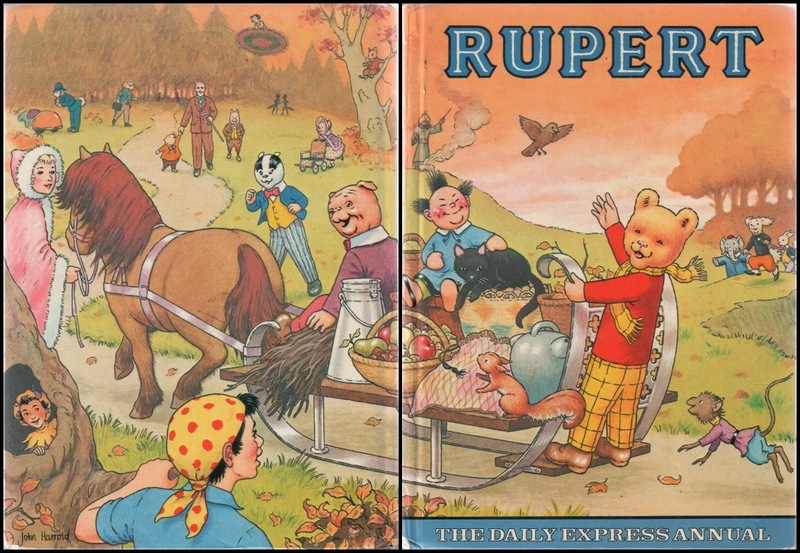 Rupert is always dressed in his yellow and black trousers with a red sweater. After each story are games, puzzles and activities. 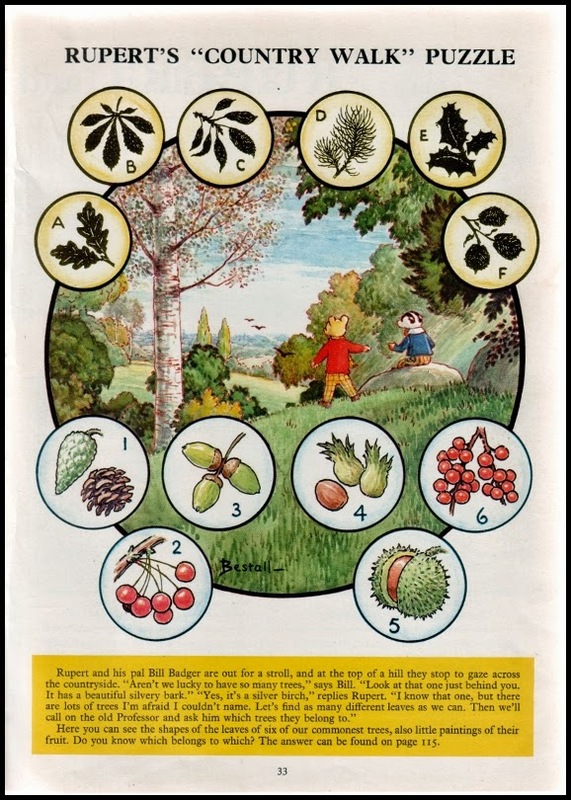 This 1972 annual has a game with pictures of leaves and their corresponding fruits or nuts that you must match. The British picnic, this time held on tropical shores. There are two cakes, jam tarts, and fresh fruit, all to be washed down with hot tea. There are two posts about pastries for you to check out - Cakes, Cookies, and Pastries and Cakes and Pastries - Inspiration Results. This annual is from 1975. Rupert often goes to exotic locales in his adventures. 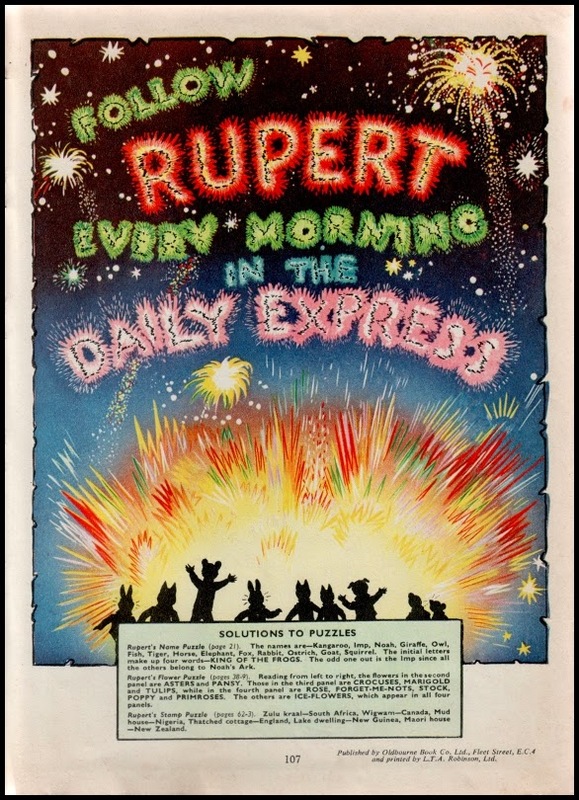 The clever device of having Rupert perpetually in the 1930's makes the locales that much more exotic. You may want to check out another post that I did in the little tour of my brain series called "Far Off Places". This cover is for the 1974 Rupert Annual. A perfectly normal winter day in Nutwood; snow on the ground, everyone making snowmen, Gregory the guinea pig on a sled flying beside Jack Frost to see His Majesty King Frost in his palace in the clouds. 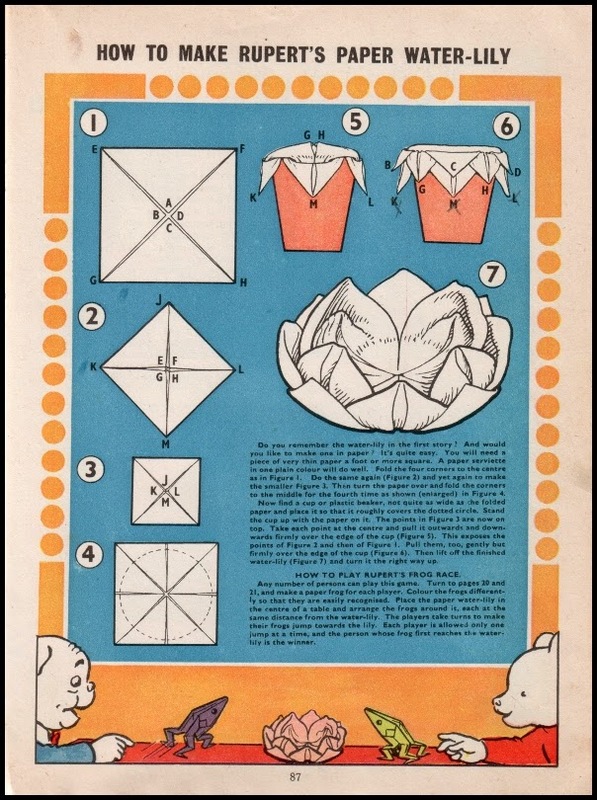 Every issue has an origami design for children or their parents to fold from a square sheet of paper. The directions for this paper water lily design appeared in the 1958 edition. The King of the Birds also lives in a castle in the clouds. 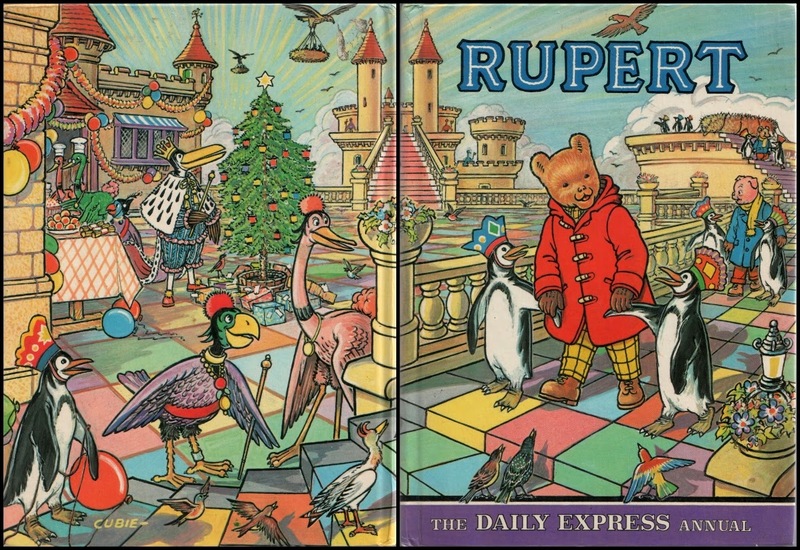 Rupert has visited him in various stories. 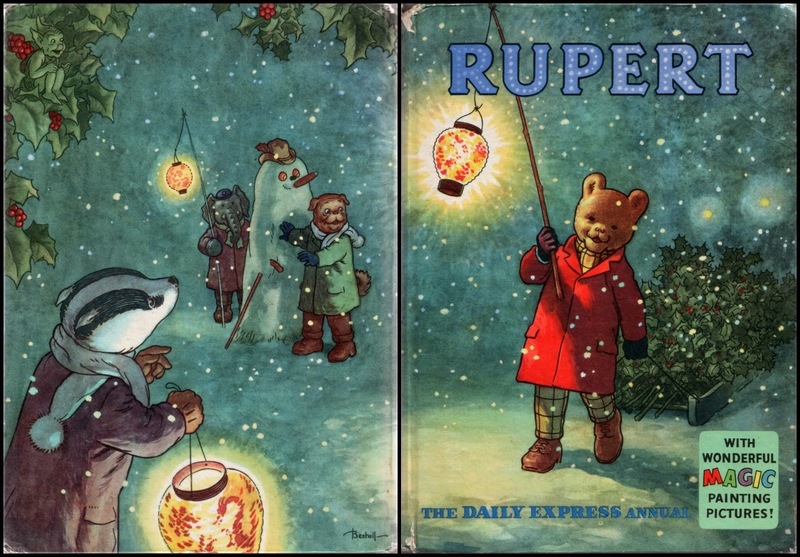 This is the 1977 cover for the Rupert Annual. I know I have used this phrase before but I love paper crowns, party hats and noisemakers. 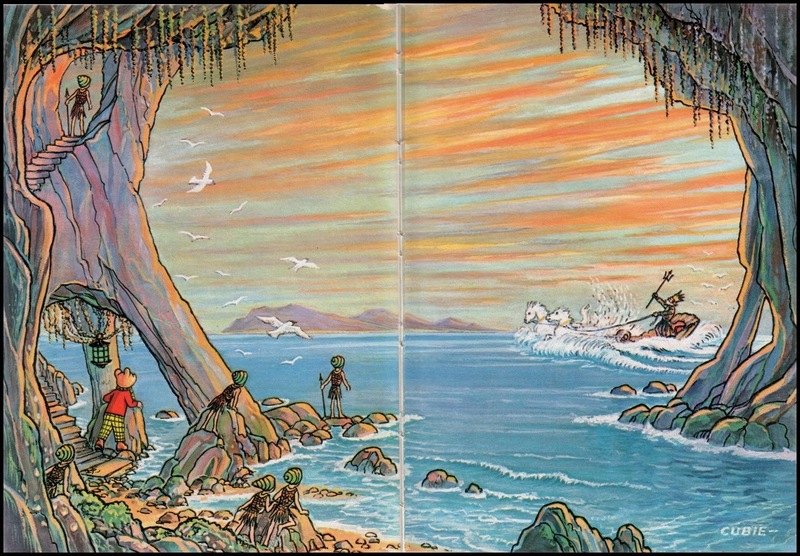 The illustrations for this story appeared in the 1978 edition of the annual. Visit my post about party hats and noisemakers here. The costumes for the characters are wonderful. The attention to detail is another of the characteristics that draw me to these books. The landscape in this 1978 annual and all of the annuals is realistic. The fantasy is grounded in the real world. 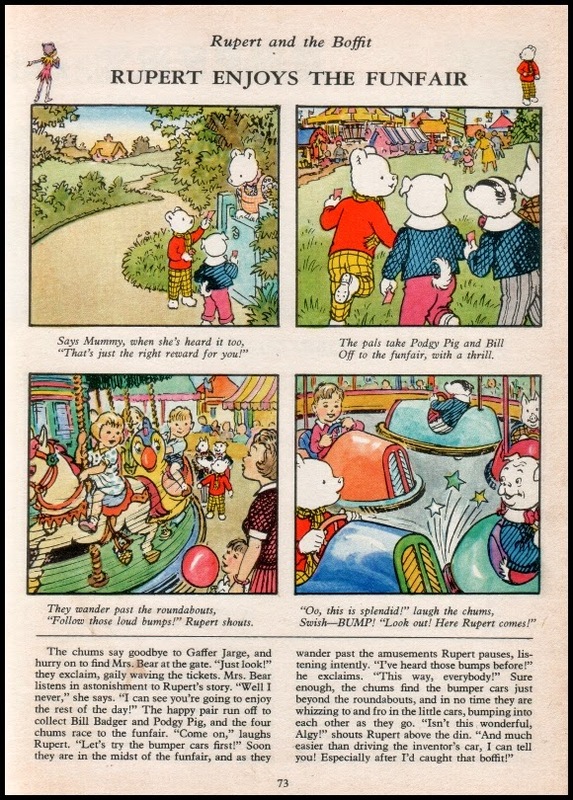 This illustration from the 1978 Rupert Annual shows fairground rides at a funfair. There are three posts that I did earlier this year about fairground rides and architecture - Wowie Zowie! Carters Steam Fair, Midway Rides at Centreville Amusement Park, Fairground Architecture and Midway Rides and one post about country fairs, Country Fairs, Metchosin Days, and the J-O-Lity Fair. The endpapers of the annuals are as interesting as the rest of the book. 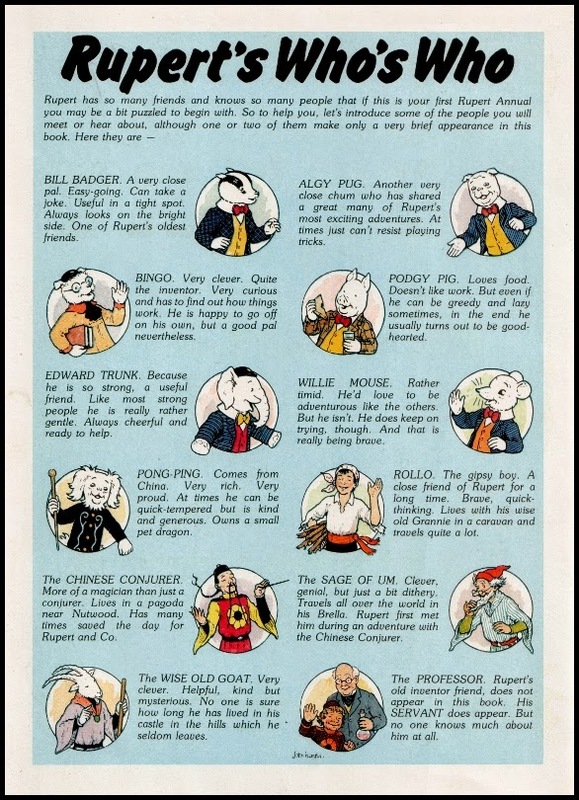 This is from the 1976 Rupert Annual. Len, thank you so much for sharing! Those are really wonderful.